The Columbus playhouse by Backyard Discovery is a cute place for the kids to hang out. It starts with our sturdy four-sided structure that is simple and fast to assemble. The front wall has a half door, windows and even flower pot holders for extra color (flower pots and flowers not included). One side has a snack window, the back has a huge picture window, and the other side has a wall with two windows also! Inside there is a kitchen counter with play sink and stove. 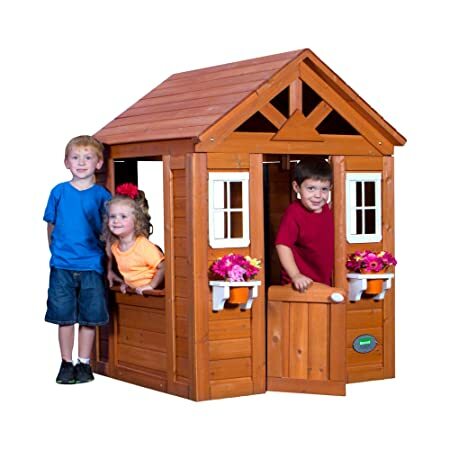 And the wood roof with sunburst gables gives the playhouse that extra touch of class. The kids will love the Columbus. 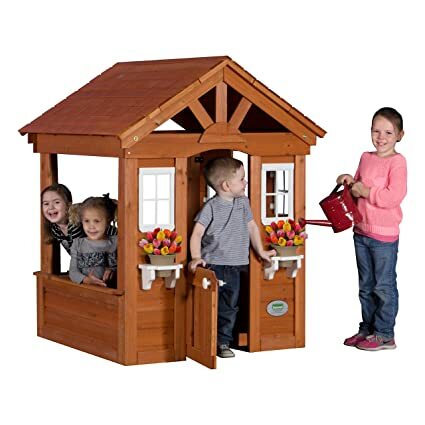 Mom and dad will love that it can be set up inside or outside. Made from 100 cedar wood that is pre-stained and panelized for quick assembly. 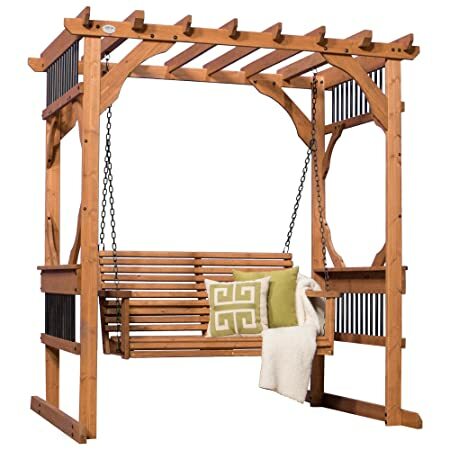 This outdoor cedar pergola swing provides a distinctive focal pt. For your backyard or patio. A beautiful newly designed, all-natural cedar swing for the backyard. This free-standing pergola swing offers the perfect place to relax & enjoy the outdoors. 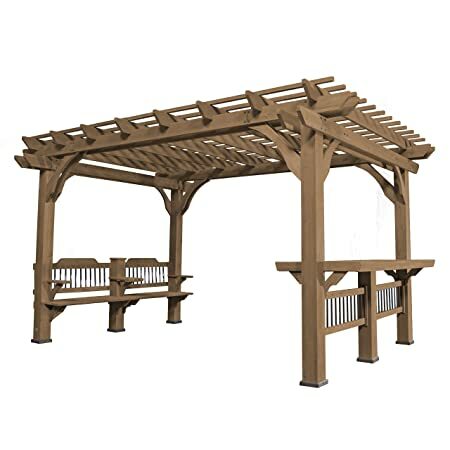 The pergola top helps define the space & complement any landscape. 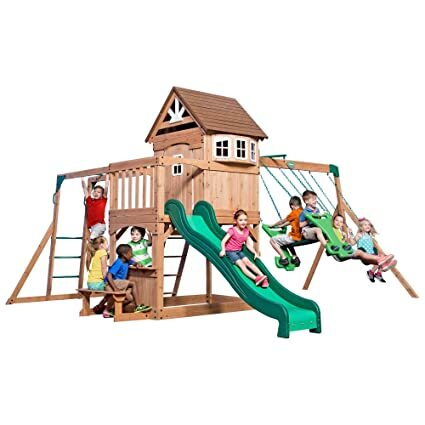 The Oceanview Cedar Wood Swing Set is the perfect play area for children of all ages, the set has tons of new features including the large hammock, open sun deck and built in measuring stick to track your child’s growth! All ages and abilities can use this set as their skills progress. Kids can gain access to the clubhouse by scaling the safe & easy to use 9 step staircase. As little ones grow, climbing the 5 rung ladder will become a piece of cake. Before you know it, they’ll be conquering the challenging monkey bars with ease! 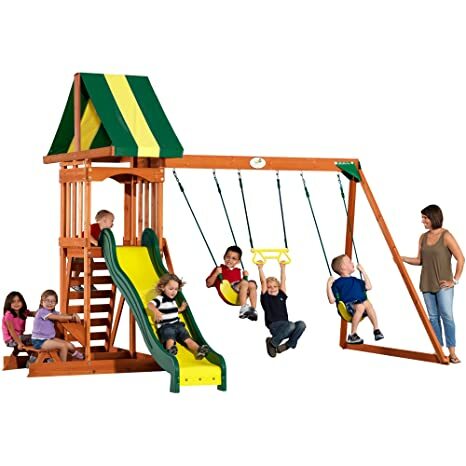 The Weston all cedar swing set is a great set with plenty of value for smaller budgets and yards. 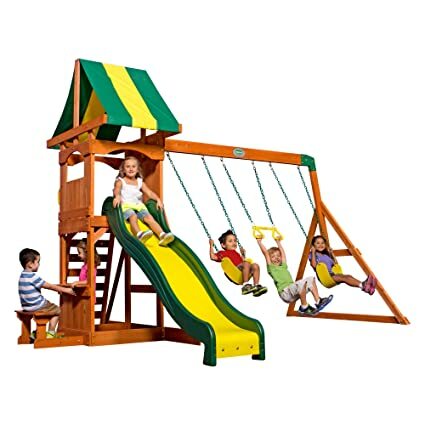 It starts with a sturdy fort that has a colorful canopy overhead, a rock wall ladder up one side and a fun 8′ speedy slide down the other. Underneath the fort is the sand box area where hours of imaginative fun are spent. On one side of the lower fort there is a snack window and outside there is an integrated bench seat for relaxing and enjoying a cool beverage. The swing beam has two belt swings and an acrobat bar for swinging away the afternoons. The Springboro is awesome! There’s a clubhouse up on the 4′ high deck that has bay windows and even a real door. Out front, a porch let’s everyone enjoy a sunny day. The swing beam has two belt swings and a two-person glider for swinging away the day. And underneath, the picnic table is perfect for relaxing and enjoying some cool drinks plus there’s a sand box area! A standard ladder gets the kids up to the deck or they can use the challenging monkey bars. Our 8′ speedy slide zips the kids back down to the yard again. The Springboro will be the place to play! 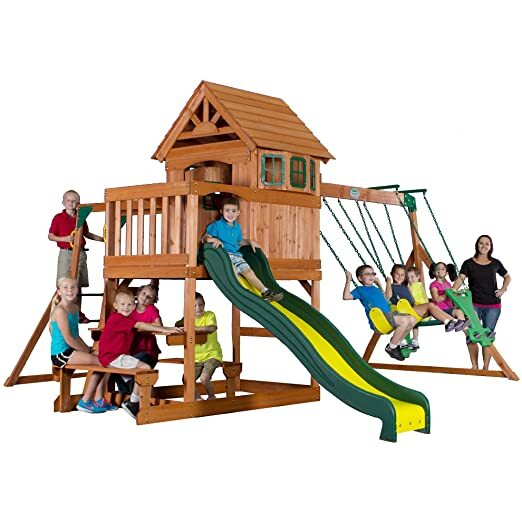 The Tucson outdoor wooden playset has a covered upper wooden deck that extends to cover the lower area as well. 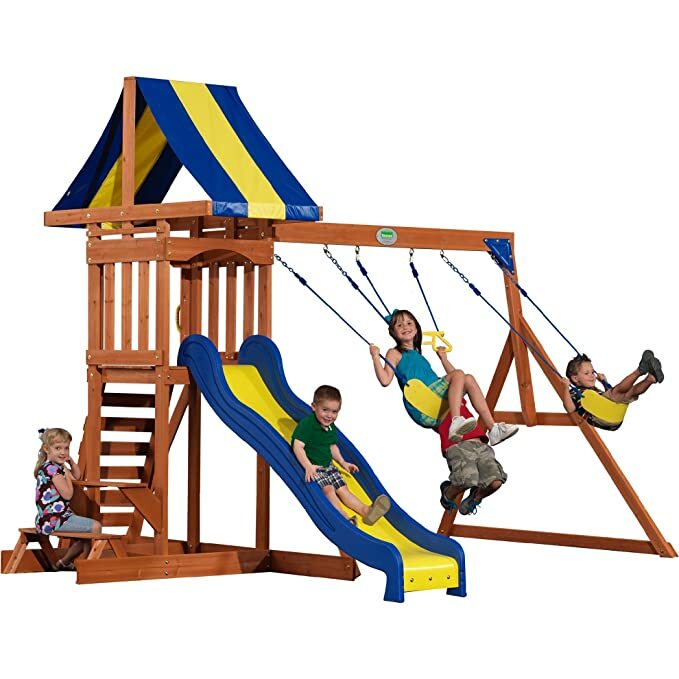 The wooden swingset has two belt swings and an acrobat bar to keep three kiddos happily swinging at one time. Scamper up to the deck on the combo ladder/rock wall and then zip down on the Super Safe Speedy Slide. A covered snack stand lets the gang cool off before going at it again. 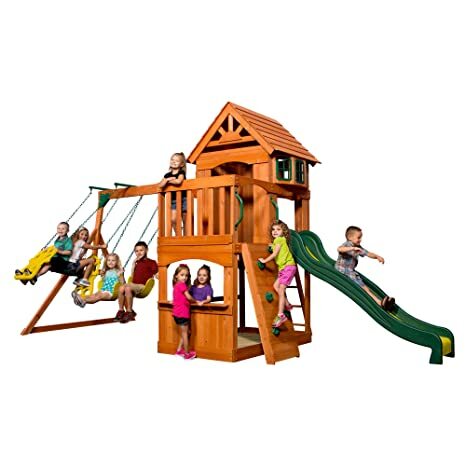 Years of fun come with this outdoor playset as well as great value. Want to change the ambiance, style & utility of your outdoor get-togethers? the contemporary designed, multilevel oasis pergola has enough space & features to host families & friends of all ages & sizes. The built-in bar/serving table along with a built-in bench help turn your backyard or patio into a shady plant oasis or sleek evening entertainment setting. The colonnade & trellis roof design are an ideal habitat for planted grapevines or climbing flowers. The spacious 30"x 86" table surface is great for seating & serving for any outdoor event. 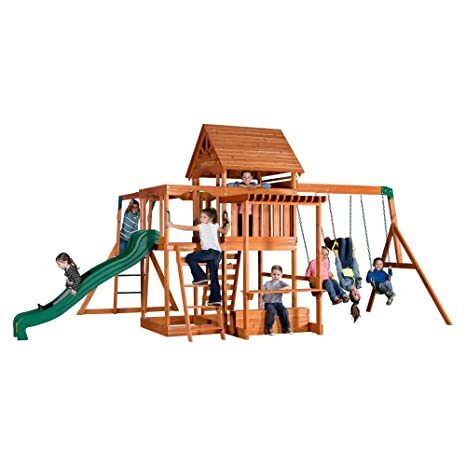 The Prairie Ridge is a full-featured cedar swing set with monkey bars your kids will enjoy for years. 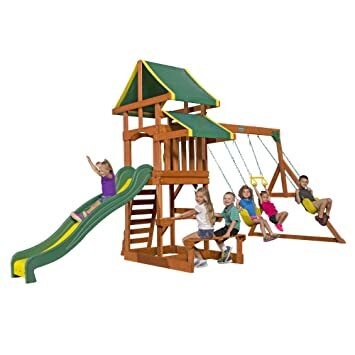 Theyll have hours of healthy fun climbing the standard ladder to the large upper play deck with sun shaded canopy, or traversing the monkey bars, and then zipping down the 8′ Super Safe Speedy Slide. Swinging on the swing set and playing on the covered upper deck make great summer memories. Out on the swing beam there are two belt swings plus a two-person glider for hours of swinging fun! Theres an observation window up top for maximum high level fun and a snack window down below with built-in bench. And when it’s time to cool down, the built in sandbox will unleash your childs imagination! Upper deck dimensions: 60-in x 30-in. Just as majestic as the home from which its name hails, the Montpelier swing set will go down in history for its endless hours of fun. 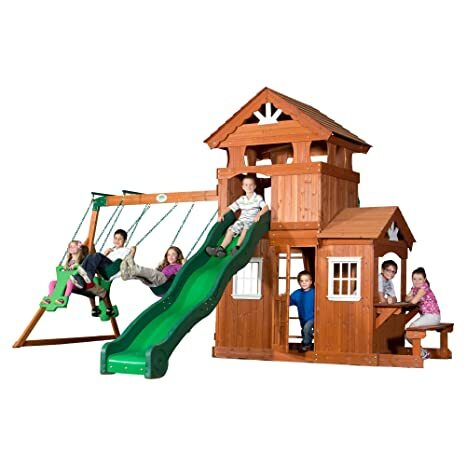 As one of our newly improved wooden swing sets for backyards, this one has all the features of a beautiful mansion: the upper discovery kids fort with its peaked roof, full door and bay windows provides plenty of play space and plenty of style; the front sun porch doubles as an extended deck and launch pad for the 8′ speedy kid slide; the monkey bars and ladder present fun access points into the playhouse. Swing into luxury on the belt swings and two-person glider, while the others retreat to the snack stand with built-in bench or sandbox area for some relaxing recreation on their historic sprawling estate! The Montpelier is made from 100 cedar. With small, tight knot structure, your lumber will be less likely to develop small cracks emanating from knots. In laboratory testing, our durable cedar wood proved to be rot resistant and highly resistant to natural decay. All lumber is pre-stained for a smooth and clear appearance, as well as cut and stamped with the part number to help speed up the building process. Some pilot-hole drilling may be required. Our patented Safe-T-Fuse hardware makes assembly easy and secure. Its laminated swing beam is built strong, with steel clam-shell brackets to ensure that swinging is always safe. Assembly requires two moderately skilled people 18-24 hours.